One of the projects in the Gaming the System sub-programme is Street Line Critics - On Tour, by Lotte Bender. Lotte has been enagaging people in interactive explorations of meaning, memory and place using chalk and poetry, first in Limerick City, Ireland and now on tour in Helsinki, 24-26 September during Pixelache. You can participate in Street Line Critics, which takes place each afternoon in the walkway/tunnel underneath Kulosaari metro station. On Sunday, 27 September, Lotte will present the results of the project, also at the same location. We asked Lotte a few questions about her work. Pixelache: I must admit that your project jumped out the most to us, from the whole Gaming the System programme - because experimental interactions in public space are really what we were looking for. Have you worked in public space before (in projects before Street Line Critics), and what did you learn from these processes? Lotte Bender: Street Line Critics would be my first fully formed project taking place within public space but I do have a number of different experiences of working in public space before this. During my college years I ventured out on the street with several little experiments. Once, with a camera peeping out of a backpack, taking remote controlled photos as I went, and another time with a group of us doing a complaints choir. Both of those received quite a number of odd stares. However, besides these little experiments, my main experience of working in public space, came from curating CATDIG in 2012, which is a cultural street festival held on Catherine Street in Limerick. Although, in this instance I was not making work myself but curating other artist’s work, I learned a lot from the process of liaising between the artists, business people of the street, and the general public passing through the street. In particular, this taught me how to engage with people on a variety of levels, from those simply passing by to those looking for an engagement with a particular advertised project. For me, that has been the key to structuring Street Line Critics within public spaces. I learned that for the kind of project Street Line Critics is, it is most effective to create varying levels of engagement, both with those who are part of the network and those encountering the work on the street, as different people have different comfort levels. And often people do wish to get involved but prefer to do so at their own pace. You are using the form of poetry to express urban experiences. What appeals to you about this format? The personal reason why poetry as a format appeals to me is that it is both an emotive and a subjective form of language. And in essence, as humans we generally see the ‘reality’ around us from a subjective and emotive perspective. As such you could ask 100 people their opinion of a particular place and all answers would be different. Yet nobody's opinion is more or less correct than another's. So it allows for the questioning of a place, and addressing assumptions about it. Poetry, by being an emotive form of language, raises itself to similar levels as the emotive language used in advertising. However, for the project nobody is trying to get you to buy or believe a new ideal or truth, but is simply trying to share something and open up new perspectives of seeing. In this way the project hopes to change the balance in the type of street messages we are bombarded by daily. In a general sense, poetry became an important part of the project due to the network of people who became involved. The project is very much shaped and owned by everyone who has participated and poetry was their preferred method of expression. It has always been an important for me that this shared ownership is asserted. As an artist I am the initiator and manager of the project, but there is equal ownership among all participants. You're going to be working in Helsinki, where you don't speak the language, and furthermore don't know the city. Do you see this as a problem? How are you approaching this situation? The way I see it, it could be a problem, but also has the scope to be an opportunity. You are right, I don’t know the language, the city, or very much about the culture of Finland but this does allow me to take a very open approach to what might happen, as well as learning new ways of interacting with people. In essence, the project hopes to open up the interpretation of a particular place, and it will be helpful going in there with completely fresh eyes, so that I can in that sense become a part of that process. I think there will be a lot of improvisation on my part but at the same time I won’t be completely in the dark. In a practical sense, I will have the support of members of These Animals, in helping me find my way around, and general information about the project will be translated into Finnish. 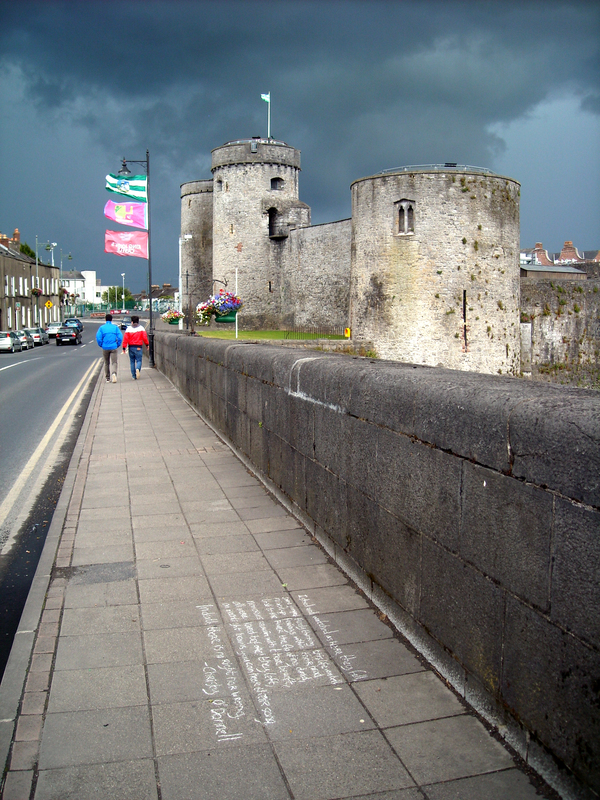 When you did this project in Limerick, you obviously had your own history with the city. But Helsinki is a new, foreign place to you. Do you, as an artist, feel like you must remove yourself somewhat from the process? Quite the opposite in fact. As I mentioned above, I think that by not having any personal experiences or history with a place, I may be able to act as a catalyst to the generation of new perspectives or questioning of a place and our surroundings. In a sense I will be going into this project a lot less biased than I may have been about certain places in Limerick. In Limerick I would have been grappling with my own perceptions and memories of each visited place ,and now I have the opportunity to look at it with a genuine fresh view that I have never seen it before. And for me that is very much becoming part of the process, for as newcomers to a place we are all very much in the present moment, consumed entirely by the new things we see. Our thoughts are not wandering; we are fully present, fully there. And this is a huge part of the project's process. Participatory art projects in general can sometimes be difficult or even obtrusive. By working in a liminal space such as a metro station underpass, you're going to be approaching people who are mostly passing through, with their busy schedules and destinations clearly a higher priority than participating in Street Line Critics. Why, in your opinion, should someone (particularly someone who doesn't have a background or interest in art, poetry, or urban interventions) stop to take the time to participate? Are you prepared for indifference or other awkwardness? I am sure there will be many people rushing through, set on their destination, unaware of the place they are rushing through, not minding the presence of Street Line Critics. Which is why it will be challenging, yet exciting to work in a liminal place such as metro station underpass. Street Line Critics has been running for over 2 years now and I have had plenty of opportunity to prepare for indifference, but in my experience, although there will of course be people who really do not want anything to do with the project, I find that by allowing for different levels of engagement there is an opportunity for people to take part even if they walk straight past. The key to this lies in the texts being written. Many of the contributions received so far very much address the nature of space such as a metro underpass. In my experience, we all have a natural curiosity, and just as the variety of advertising messages can plague our minds, without us even realising we read them, a glance at a poem can also linger to be questioned later on. So to answer your question, those who are uninterested with their priorities set elsewhere, are unlikely to stop and nothing I say will change their minds. But Street Line Critics' strength has always lain in its subtlety and, as such, we won’t be stepping in front of anyone demanding their attention but at the same time we are leaving marks of a thought process which will often be glanced at even by the most uninterested passer-by. And then there will always be those whose curiosity brings them a step further. Interestingly enough it can sometimes be enough for just one or two people to stop and take an interest, for a larger crowd to then gather. So in many ways it is hard to know how it will develop, but there are a number of ways to approach this without becoming obtrusive in any way and this will very much depend on the atmosphere of individual times of the day. Given these possible challenges, how do you evaluate a project such as this? What do you personally hope to see happen in this iteration of the project? There is always a difficulty in evaluating a project such as this because often at the end of the day we are still bound by the existing value norms promoted in the wider art world. Which is difficult for a temporary project based on interactions, rather than objects. The evaluation for me lies in the project's ability to extend as a network, and as a platform for expression. So it is more a tool for people to use rather than an aim to force involvement and make up numbers, so to speak. And that is where the value starts for me. So even the fact that I already have lots of contributions streaming in to be written in Helsinki, shows that people are using it as a platform to share their thoughts. The second evaluation would be if this sharing, manages to strike a chord with people in Helsinki and unlock something meaningful for them or create a space to question their surroundings from a new perspective. Then what I would personally hope is that people in Helsinki also feel they can use the project as a tool, and perhaps take the idea to use to their own ends, or contribute something to the existing project while it is happening in the metro underpass, and perhaps even send their own thoughts back to Ireland to be shared there, creating something of a cultural exchange. Pixelache has a reputation for being a technology-focused festival, though the festival directors feel that our focus isn't so much technology but the experimental edges of culture. 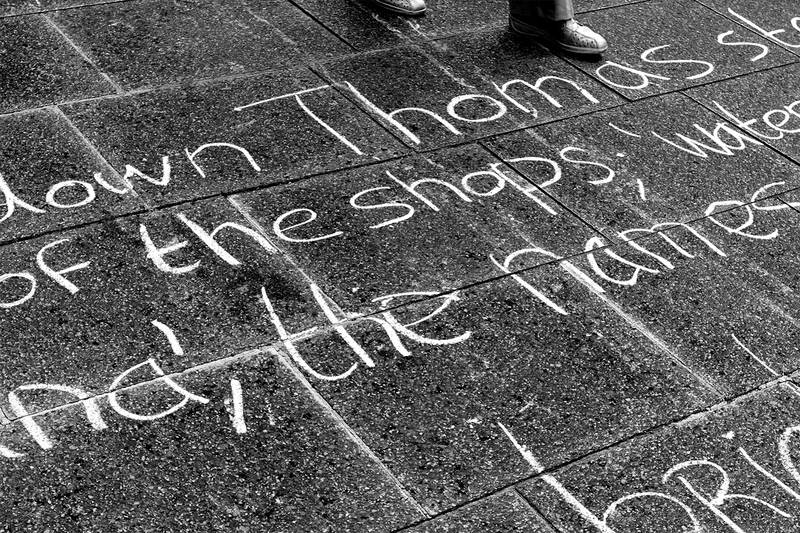 Though we're going to have workshops on mesh networking and audiovisual artworks in the festival, we're thrilled to have something as low-tech as Street Line Critics, which as far as we understand will only use the technology of 'chalk'. Do you feel that such an interface makes a statement? Yes, the use of chalk is an essential part of the project's conceptual and theoretical basis. As I mentioned before, the project is very much about sharing real experiences of place and questioning these experiences, rather than simply accepting ideal or promoted ideas of a place. However, a message, any message, in its permanence, leans towards becoming a statement or a new projected truth. The contributions in Street Line Critics however are always temporary due to being written in chalk. In this way they offer a momentary possibility, but if it rains you could miss it the following day. The project therefore aims to maintain the subtlety of opinion and show through the use of a temporary medium that every experience or opinion has value, but none is so permanent as to be the real truth. For we each experience the world differently, even though we could be looking at the same view, tasting the same food or being part of the same conversation. We all come away with an experience different to that of our neighbour. As such, it opens up the space to accept difference and discuss and question the truths we live by. It is like making a primitive mark; it doesn’t pretend or expect anything but at the same time it does exist and has the opportunity to branch off into other thoughts, ideas and statements. The festival theme this year is 'Living Spaces'. What does this mean to you? A living space for me is a space which is not limited to one interpretation, which has no set future or use. But rather a space which is shaped by the contributions and collaborations of all those who use it.